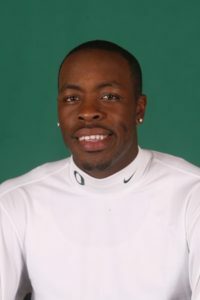 Dennis Dixon, U of Oregon quarterback, arguably the top performer among all college signal callers in 2007 before a knee injury prematurely curtailed his Heisman Trophy campaign. Dixon was the starting quarterback for San Leandro High School‘s football team beginning his sophomore year. In his senior season of 2002, Dixon threw for 2,426 yards and 30 touchdowns, leading his team to a 12-1 season. Dixon completed his high school career with 5,951 yards and 79 touchdowns, guiding San Leandro to a 36-3 record, with his only losses coming in three straight California North Coast Section 4A championship games to perennial powerhouse De La Salle. Dixon was also a highly recruited baseball player, and was initially drafted by the Cincinnati Reds in the 20th round of the 2003 Major League Baseball Draft. However, he did not sign because he wanted to go to college and get a degree. Dixon opted to grayshirt (attend school part-time and retain eligibility) for the 2003 season and played his freshman season in 2004 behind Kellen Clemens. He appeared in six games, passing for 73 and rushing for 40 yards. In his sophomore season of 2005, he was expected to play primarily in a backup role during Clemens’s senior season. However, against Arizona, Clemens broke his ankle, and Dixon came into the game, though he later left with a concussion. With Clemens out for the season, Dixon split time with fellow sophomore QB Brady Leaf and guided the Ducks to four regular season wins and a second place finish in the Pac-10, before dropping a 17-14 loss in the Holiday Bowl against Oklahoma. 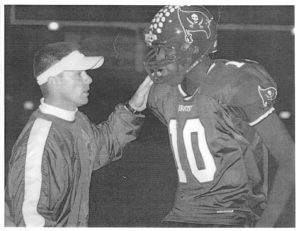 Prior to his junior season in 2006, Dixon was named full-time starter by head coach Mike Bellotti. He led the Ducks to a 4-0 start, including a 34-33 comeback victory over the Oklahoma Sooners. After a win over Arizona State, the Ducks lost 48-24 to Cal before Dixon’s hometown crowd. After being benched in favor of Brady Leaf, Oregon went on to lose three of their four final games and finished with a 7-6 record. Despite his shortened season, Dixon still finished the season fourth in the conference in total offense (219.3 yards per game). Dixon was named the league’s second-team academic all-conference quarterback. In June 2007, he graduated from Oregon with a degree in sociology and a 3.27 grade point average. In 2007, Bellotti again named Dixon, now a senior, the starter prior to the season. The season started off quickly for Dixon against Houston, in which Dixon accumulated 141 yards rushing, the most ever by an Oregon quarterback. The following week against Michigan, Dixon threw for 3 touchdowns and ran for another, generating 368 yards of total offense. Dixon was named Pac-10 Offensive Player of the Week and USA Today National Player of the Week. In the next two games, he led the Ducks to big wins over Fresno State (where he threw for two touchdowns and ran for another), and Stanford (where he completed 27 of 36 passes for 367 yards and 4 touchdowns and ran for another). Against Cal, Dixon threw his first 2 interceptions of the season, but led the Ducks down the field in the final minute for a potential tying score before Cameron Colvin fumbled the ball through the end zone in the final seconds for Oregon’s first loss of the season. Wins in the following weeks over Pac-10 powers USC and Arizona State pushed Oregon to a #2 ranking in the BCS poll and first place in the Pac-10. During the Arizona State game, he left the game with a knee injury, but was cleared to play two weeks later against Arizona. In the first quarter of that game, he ran 39 yards for a touchdown, but a few plays later, his left knee buckled and he left the game because of the injury, and the Ducks went on to lose 34-24. It was then revealed that Dixon had torn the ACL in his left knee against Arizona State and aggravated it against Arizona. In the last game of the season against arch rival Oregon State, they lost and the Beavers broke the streak of the last 10 years in which the home team had always won. Without Dixon, and following an injury to backup Brady Leaf as well as a long list of injuries to the entire Duck team, the Ducks lost the last two games of the season, but went on to defeat South Florida 56-21 in the 2007 Sun Bowl as Dixon watched from the sideline and continued to cheer on his team. After undergoing surgery to repair his torn ACL, Dixon walked with no apparent limp at the NFL Combine headquarters in Indianapolis in February. Dixon was unable to perform any Combine drills, but worked out at Oregon’s Pro Day and held impressive individual workouts later. In the 2008 NFL Draft, Dixon was taken in the 5th round (156th overall) by the Pittsburgh Steelers. It was speculated that he could be used in the manner that the Steelers used Antwaan Randle-El (a college quarterback turned NFL receiver). Dixon passed for a combined 12-for-24 in passing attempts in two 2008 preseason games, in addition, he ran for a 47-yard touchdown against the Buffalo Bills. On December 28, 2008, Dixon completed his first official NFL pass to Hines Ward—the reception was Ward’s 800th. Dixon made his first career start on November 29, 2009 against the Baltimore Ravens after injuries suffered by Roethlisberger and Charlie Batch a week earlier moved him up the depth chart. In the game, the Steelers went on to lose 20-17 in overtime. Dixon finished with 12 completions out of 26 passes, for 145 yards, with one touchdown and one interception and also ran for 27 yards on three carries, including one run for a touchdown. However, his one interception was in the overtime period, allowing the Baltimore Ravens to kick a field goal for the winning score. Dixon wore the number 2 during his first two seasons with the Steelers, but after the trade of Santonio Holmes, Dixon took number 10, his college number. With Roethlisberger being suspended for four games to start the 2010 season, Byron Leftwich was named the Steelers’ starter. Even though Dixon threw two interceptions in his only preseason start, a serious knee injury to Leftwich during the preseason finale led to Dixon being named the opening day starter. After winning against the Atlanta Falcons in Week 1, Dixon tore his meniscus while playing against theTennessee Titans the following week. He was put on Injured Reserve on October 13. Dixon on sideline during Super Bowl XLVII. On September 2, 2012, the Baltimore Ravens signed Dixon to their practice squad. He was cut from the squad November 7, 2012, and was re-signed to the practice squad again on November 13, 2012. He was the practice squad QB when the Ravens won the Super Bowl and earned a ring. Dixon signed a two-year contract with the Philadelphia Eagles on February 14, 2013. The move reunited him with new head coach Chip Kelly, who was the offensive coordinator at Oregon during Dixon’s senior year in 2007. Dixon was released during final cuts on August 30 as the Eagles went with three quarterbacks for 2013: starter Michael Vick, back-up Nick Foles, and rookie Matt Barkley. On October 8, 2013, Dixon was signed to the Buffalo Bills practice squad, following an injury to starting quarterback E.J. Manuel. The Bills released Dixon on August 25, 2014. On October 7, 2014, Dixon was signed to the Arizona Cardinals practice squad. He was released on October 13, 2014.